Hopefully he was lone wolf bomber and not part of a group. If you want to do criminal stuff, don’t use your own cell phone or google for your searches. Authorities also relied upon store receipts showing suspicious transactions from the person and obtained a search warrant for his Google search history that showed him conducting searches they considered suspicious, the official said. Authorities relied upon cell phone technology to trace the suspect to a hotel in Williamson County, the official said. "Manley said an officer had fired at the suspect, and another officer who was knocked back by the blast was treated for minor injuries." Probably there will be no mention of a good guy with a gun ended the terror. We can be thankful, he was no unibomber. Unfortunately with the internet and social media, when something like this happens it becomes a tragedy for lots of people. Apparently you want to set your facebook to private rather than trying to erase your history. Used exotic batteries bought online, helped them catch him. Used cell phone location software to figure out his cell phone number. When he turned his cell phone on, they then had his location. No unibomber. Just a dumb evil idiot. philip964 wrote: We can be thankful, he was no unibomber. We knew that when the second bomb went off, didn't we? 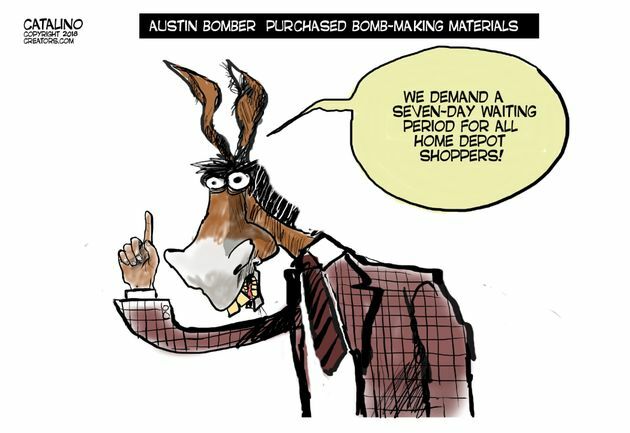 Grundy1133 wrote: yeah but based on austin's track record it wouldnt be surprising..
Austin has a track record of liberals planting bombs in neighborhoods? I'd like to read those articles...got any links? i never mentioned their track record including bombs in the mail... I didn't specify what their track record was. but i was referring to liberals doing stupid crap. Lots of people do stupid crap...liberals, conservatives, libertarians. Assigning blame to liberals just because is the same thing they do to those of us who own firearms every time there is a shooting. Am I the only one that thought this was funny? The media is glossing over the real common denominator to the mass killings and violence, a troubled young man that didn't get the proper attention and care he needed. Notice how little media attention and outcry there is over this now since it didn't involve a scary looking black gun. He even referred to himself as a "psychopath" in his confession video found on his cell phone. If you look at the other mass killers, they too were troubled people that needed help. Texas DPS apparently recently released video from aerial surveillance they conducted to track down the bomber. There's a boom at the end. ... There's a boom at the end. I've always been a sucker for a happy ending.